Where does a year go? This time 12 months ago Leeds fans were coming to terms with another wasted season as a play-off bid that had looked nailed on for months spectacularly hit the buffers. It was with a mixture of pain and frustration, but at least an element of pride, that we waved the season off in a seventh-placed position that ultimately brought us nothing. One year on and we’re battling exactly the same disappointment, except the pain and frustration came a lot earlier and there was absolutely no element of pride. To say the 2017/18 season has been disappointing is a monumental understatement, not just after last season’s near miss but also after the positivity of last summer. Let’s face it, mistakes have been made and performances have been nowhere near good enough. You can point the finger in various directions because there isn’t one solitary reason for Leeds United’s failures this season; football isn’t always as simple as that and there aren’t many individuals at the club who can look at themselves and say they performed to an acceptable standard throughout a campaign that brought such little cheer. So yet again, Leeds United face a huge summer of re-building. We do believe there are some elements of a decent side within the first team squad, but that only amounts to about half a dozen players. However, with a raft of promising youngsters emerging and three or four key additions, things can very quickly look a little more positive, as long as we can clear the decks of a lot of the dead wood that habitually ends up hanging around Elland Road. A key ingredient of any successful team is to build some camaraderie and team spirit and that seems to have been badly lacking all season. This team isn’t a ‘team’. There hasn’t been much evidence of fallouts or visible ructions within the squad, but equally, they don’t look like a squad of players that would die for each other, who know exactly what each other’s role is and who are organised and well-drilled. It doesn’t help when nobody knows from one game to the next who is going to be playing, and while a lot of this is down to coaching and management, a major reason why the team is so fragile and afraid to perform at Elland Road is also down to personality, and for that reason character, attitude and experience is as important in this upcoming transfer window as ability. One thing that we can’t complain about at the Old Peacock is the crowds at Elland Road this season. Even when it became perfectly clear that the season was going down the pan, the attendances for home games rarely wavered. I guess we were helped by the league leaders Wolves visiting in midweek and a couple of Yorkshire derbies, but all the same it is impressive to maintain an average home crowd of around 30,000 when you’ve won only three games in four months and are spending yet another season achieving absolutely nothing. Home games at the Old Peacock have continued to be special occasions and our resident house band The Snapp have again proved to be incredibly popular. So much so that they have warmed the crowds before the two Leeds Rhinos games recently and we hope they will be providing plenty of tunes and getting you all geared up for the Josh Warrington world title later this month, and for the England friendly versus Costa Rica in June. Speaking of Josh Warrington, we are very much on the countdown to May 19th and we are getting prepared for what is going to be one hell of a day. 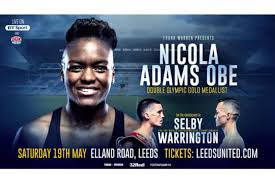 With the Elland Road gates opening at 4pm and an undercard that includes the darling of Leeds – double Olympic champion Nicola Adams – we are sure to be having a busy afternoon in the pub. Add to that the Royal Wedding, the FA Cup Final and Leeds Rhinos v Castleford Tigers in the Magic Weekend at Newcastle and this is all building up to a quite unique day that will certainly be keeping our bar staff occupied. Ticket sales for a chance to see the crowning of the first World Boxing Champion from Leeds are looking pretty good and we are certain there will be a very special atmosphere awaiting the current title holder Lee Selby as he enters Elland Road on the night, and we will be doing our best to add to that, so get yourselves along early for what promises to be an amazing sporting occasion in Leeds. Before all that though, don’t forget there is one Leeds United home game remaining before the players head off for the summer, or if they are really unlucky, to Myanmar. Queen’s Park Rangers are our visitors on Sunday May 6th, which is a bank holiday weekend, and as we have a 12.30pm Kick-Off we will have The Snapp performing after the game, and not before as normal. So as to keep noise to a minimum we can’t have the band on too early, so why not make a day of it and join us after the game? Early indications suggest the weather should be pretty good too, so what better way to toast the end of the season than a glorious sunny afternoon in the Old Peacock beer garden listening to some quality tunes? And of course, if you are not satisfied with just the one bout of ritual disappointment and humiliation, England are heading to Russia next month for the World Cup, so in our next blog post we will be telling you all about our plans for the month-long football jamboree, that fingers crossed might retain some home interest longer than a fortnight. But for now let’s raise a glass to the 2017/18 season, wish it good riddance and party on to the sound of good things to come.